If your dog seems stiff or has difficulty getting up from a nap, this could be a sign of arthritis. According to the Arthritis Foundation, about one in five dogs develop stiff, painful joints common to this condition. So what’s a pet lover to do? Your dog still needs to get outside. Don’t be put off if your pet is moving slower than before. Dogs with arthritis still benefit from exercise. It helps lubricate the joints, builds strength and reduces pain. However, now you’ll want to put a little more thought into your walks than when your pet was a young pup. Short, frequent walks are preferable. 10-15 minute walks are enough to get the synovial fluid moving around your pet’s joints. This viscous liquid “cushions” your pet’s joints and reduces friction. Check the weather. If it’s winter, take your dog out during the warmest part of the day if possible. Cold, dank weather can intensify the pain of cranky joints. After you come back in, wrap your dog in a warm blanket or towel near a heat source and give them a soft surface for resting. Warmth penetrates the bones and reduces arthritis pain. There’s a reason so many people retire to Florida! Snuggy Boots Suspender System will give your pet extra joint support. The elastic tension leg straps give a “lift” to the joints so it’s easier for dogs with arthritis to walk. Once they have this joint support, they’re not “favoring” one leg or another as much and can walk easier. You’ll be able to tell they’re feeling better. Arthritis commonly strikes large breeds like Mastiffs and Great Danes though dogs of any size can suffer. You can support dogs with arthritis by keeping them as comfortable as possible including joint support and giving them a comfortable place to rest. 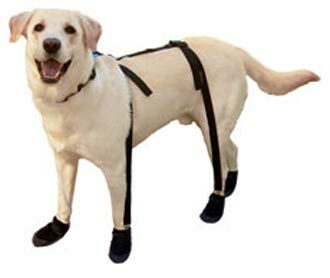 We’re proud of the Snuggy Boots Suspender System as a way to reduce your dog’s arthritic pain.